Despite this good start, the wall was abandoned after only twenty years. 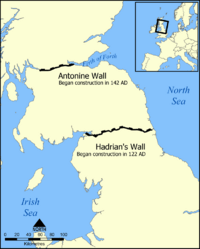 The garrisons were sent back to Hadrian's Wall. In 208 Emperor Septimius Severus re-established legions at the wall and ordered repairs; this has led to the wall being referred to as the Severan Wall. However, the occupation ended only a few years later, and the wall was never fortified again. Most of the wall and its associated fortifications have been destroyed over time, but some remains are still visible. Many of these have come under the care of Historic Scotland and the UNESCO World Heritage Site Committee. This was the only attempt the Empire made to hold Scottish territory. A near infra-red kite aerial photograph of Kinneil Roman Fortlet, near Bo'ness at the eastern end of the Antonine Wall. Antonine Wall Facts for Kids. Kiddle Encyclopedia.